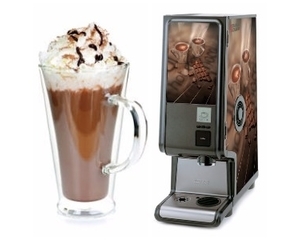 Keep warm this Winter with our NEW Hot Chocolate Machine! Try Our New Hot Chocolate Machine! Real Chocolate, Real Creamy, Real Fast and really Profitable..For only €2 per day, you can serve Lovely Hot Chocolate at the press of a button ! Suitable alongside your existing Coffee machine and Now you have a full Beverage Menu ! Add a few Marshmallows and a dollop of Cream and turn yum into YUMMMMY ! And we will give you 500 FREE DRINKS TO HELP PAY FOR YOUR MACHINE…! This is an offer you won’t want to miss! for further information and a quotation.